Mo Willems’ new spin on the classic Goldilocks and the Three Bears does not disappoint! I was so excited to receive my copy in the mail I read it right away, laughing all the way through it! When my 3rd & 4th Grader saw it they begged to have it added to our bedtime reading along with the chapter books in which we are currently engrossed. 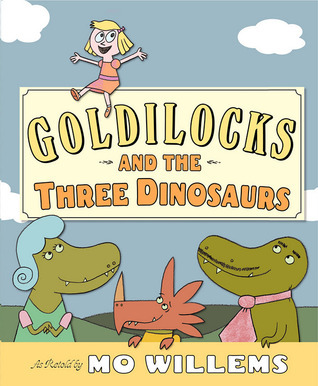 Goldilocks and the Three Dinosaurs has the wonderful tongue-in-cheek humor of the Elephant & Piggie books (my favorite of all Willems’ work! ): when Goldilocks stops to think for a minute the author points out that is longer than she usually takes for either. In this version Papa, Mama and the visiting Dinosaur from Norway already know the story of Goldilocks and the Three Bears. They use the fairy tale as a blueprint to set a trap for an unsuspecting, “poorly supervised” little girl, plotting to fill her with chocolate pudding and then eat her. The illustrations of Goldilocks literally diving into the bowls of chocolate pudding delighted my 8-year-old; all the chairs are “too tall” since they are for dinosaurs; and Goldilocks never makes it all the way to the beds. There are two delightfully silly morals to the story–one for Goldilocks and one for the dinosaurs. I highly recommend Mo Willems’ latest great contribution to children’s literature for ALL ages. Older readers (including adults) will belly-chuckle at the slightly more ascerbic humor that runs parallel just below the surface of the silliness that younger readers will devour in the same way as Elephant & Piggie, Pigeon and Knuffle Bunny and the more recent Hooray for Amanda and Her Alligator!